This comes on top of award winning coverage of core C# features, both old and new, that have made the previous editions of this book so popular (you'll find everything from generics to pLINQ covered here). The mission of this text is to provide you with a rock-solid foundation in the C# programming language and the core aspects of the .NET platform (assemblies, remoting, Windows Forms, Web Forms, ADO.NET, XML web services, etc.). Once you digest the information presented in these 25 chapters, you’ll be in a perfect position to apply this knowledge to your specific programming assignments, and you’ll be well equipped to explore the .NET universe on your own terms. For anyone with a basic background in programming looking to get into C#, I cannot recommend this highly enough. I had been teaching myself programming for years but never seemed to get anywhere meaningful. There are way too many tutorials that stop way too soon and many that start way too in depth. This takes you through the vast in-between stages.The first third to half takes you through all the usual lessons like objects and access modifiers, but largely teaches them for their own sake as opposed to a lot of their uses in more-meaningful applications. If you already have a basic background in programming, this can feel mind numbing but is still worthwhile. After this the book opens up and covers an incredibly broad range of topics, in my personal opinion, in a perfect amount of depth. For me, the IO/XML, SQL, and WPF sections were instrumental in advancing my education. If you are considering this book, and you really should, spring for the physical copy instead of the Kindle version as it makes the code much more readable. Additionally, if you are just getting into programming, I highly recommend the many programs like Codecademy to get the basics down first. I started with some experience, but I can imagine this book being a little less helpful without it. I really like this book! Let me tell you why. It covers a broad scope of the subject of C# with .NET, going into medium depth, and flowing nicely from chapter to chapter. I discovered that it provides both the framework and material for a good self-study program. The author communicates very clearly and provides many example projects with enough detail to let you either use them as tutorials or just read through them. While I often just plunder through online and printed references looking for nuggets of information to solve specific technical problems, that is not how I used this book. Instead, I spent about 4 months working through the book from cover to cover, aiming for more breadth of knowledge on the subject. I bought the printed book, and then bought the eBook from the publisher for a small additional cost. Working through examples, the PDF version was great for reading on a second monitor, cutting and pasting the example code into Visual Studio. (The sample code is also provided as downloadable files.) The printed version was great for back-yard reading with a highlighter, pen, and beverage as supplemental equipment. The example code worked and the text was well-edited and accurate. A few typos in the final chapters caught my eye but were easy enough to read through. There was one important snag in the section on ADO.NET, where Microsoft has deleted the Database Diagrams feature that the author's example relies on to establish the relationships between database tables in a database that is used throughout the remainder of the book. Fortunately there are plenty of online references that will help you to work around this. 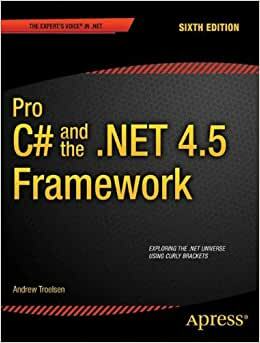 This book is an excellent resource for experienced programmers who want to learn the breadth of contemporary C# and associated parts of the .NET framework. The depth of the coverage on each subject will take you to no more than a medium level of knowledge, so if you need to go deeper you'll want to find other resources. With about 1600 pages in the body of the book, it provides a nice balance of breadth and depth. Good book all in all. A couple of issues. The content of the book could be a bit better balanced in terms of progressive tuition. He goes way into (not totally necessary, but nevertheless interesting) deep levels of detail early on and throughout the text. You have to wade through over 30 chapters of this before you get to know how to design a form using WPF. "Bake the cake first then add the topping" style of tuition taken to the extreme. Still an excellent body of knowledge.